Free WiFi At 3 MRT Stations From Aug 22, 2 Of Which Has New Charging Points Too! Earlier this year, we wrote that the Singapore Land Transport Authority (LTA) will be implementing a trial for free WiFi at 28 Singapore Mass Rapid Transit (MRT) stations. The trial is implemented as part of the Land Transport Master Plan initiatives to provide better service on the public transport network. 8 months later, it seems like things are finally happening. According to Channel News Asia, City Hall, Orchard and Raffles Place will be the first of 28 MRT stations to offer free Wireless@SG connection at the platform level. The rest of the 25 MRT stations will get the free Wireless@SG connection over the next 9 months. 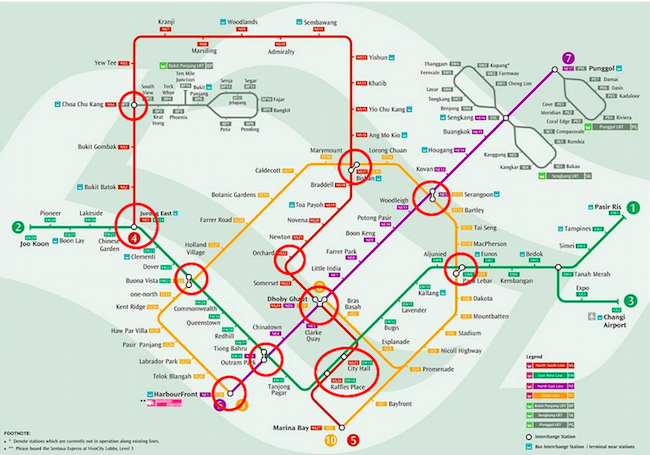 The 28 Singapore MRT Stations include all the North East Line platforms, as well as “12 other stations with high commuter usage”, namely, Jurong East, Raffles Place, City Hall, Dhoby Ghaut, Bishan, Serangoon, Buona Vista, Outram Park, Paya Lebar, Orchard, Choa Chu Kang and Harbourfront. ‘No Eating and Drinking’ MRT Rule Begone! Or, Maybe Not. Here are all the MRT stations with upcoming free WiFi. The free WiFi service at the three abovementioned MRT stations is available from August 22nd, 2014. “The introduction of Wireless@SG at the platforms of all North-East Line stations and 12 other stations with high commuter volume is aimed at enhancing wireless connectivity for commuters. They can now check their emails, surf the Web, or connect to social media platforms on their phones and tablets more speedily while they wait for the train,” said LTA Chief Executive Chew Hock Yong. 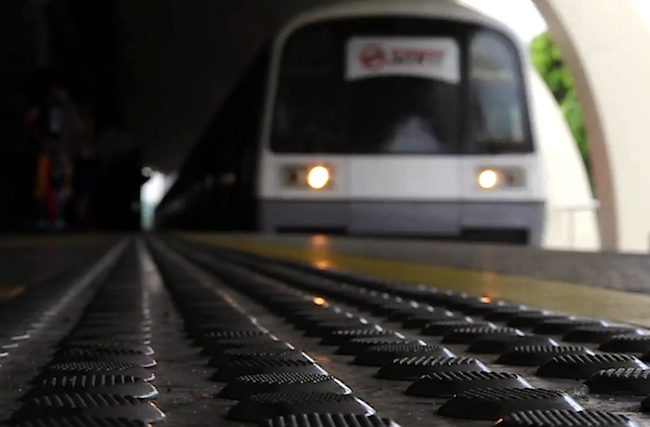 The new announcement is timely too as SMRT has recently added new charging points at four MRT stations – City Hall, Orchard, Tanjong Pagar and Kent Ridge. Train commuters in Singapore will be able to charge their mobile devices at these charging points for free. According to SMRT, these charging points, which are under a trial, is one of the new initiatives rolled out by the company to enhance commuters’ travel experiences. The four stations were chosen for the trial due to their high traffic flow. City Hall and Orchard MRT stations are the two stations with free WiFi and the new charging points. 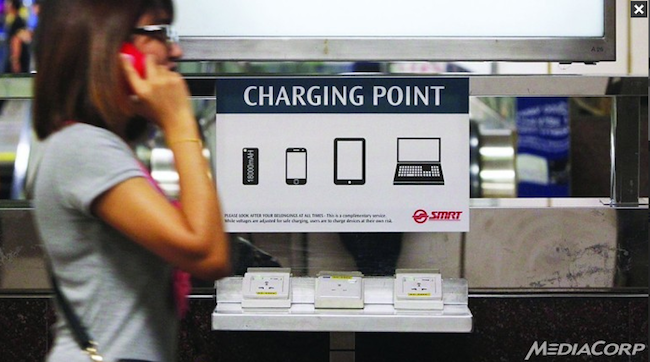 You Can Now Charge Your Devices At 4 Singapore MRT Stations! “A flat phone battery doesn’t quite help when you urgently need to make a call, and so we’ve installed several charging stations along the network so you can make a quick charge. The very first charging station is installed at the free concourse area at City Hall station, with Orchard, Tanjong Pagar and Kent Ridge stations to follow over the next few weeks. We hope this helps with your journey, and ask for responsible usage of these charging points.” – SMRT through its Facebook page. With the free WiFi and new charging points, would we see clusters of smartphone users cluttering around the MRT stations?